My phone's like a tank. The MotoRazr V3 looks like a truly cool and smart handset. 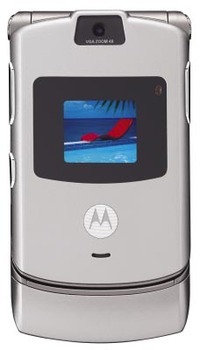 It is quite surprising to know that it is not as wonderful in quality as the other Motorola handsets. Looks great, but the phone is a bit old now. I have one at home colored black. It has been with me for almost 2 years now. My aunt gave last month a cellphone just like this only its color black. This cellphone has many functions that are useful for your everyday life. Its a handy phone with lots of application I can use. One thing that made it outstanding is the simplicity of the design. My first video phone was a motorolla and that truly was a brick. I think It has been with me for almost 2 years now.Thanks. Great post!the topic is really good,"The 'razing razrs' for Designing Our World".I got inspired by it. There is too much in the market and it is hard to decide which one would be best for you.The needs of the consumer has also increased to a great extent and they want to settle for nothing but the best. hi I have one at home colored black. I have one at home colored black. I found your site being bookmarked in one of the social sites. I'm glad I visited it. Interesting articles you have here. We just couldnt leave your web site before letting you know that we genuinely enjoyed the quality data you offer to your visitors? Will be back soon to check up on new stuff you publish!